Boundless experience has shown us that having seperate measuring and fitting teams leads to the perfect experience for our clients. From our humble beginnings to the deservably celebrated work you see today, Plantation Shutters always have, and will continue to remain as London's superior shutter specialist. There was a time in the life of Plantation Shutters whereby I used to measure and fit all the shutters, one day I would be holding my pen and paper and the next day it was a screwdriver. Not electric. This was a more needs must scenario, with evolution, I was able to employ someone who helped me measure and fit, so we had 2 people driving around doing the same job, and this went on until we had probably 3-4 people who all did a similar job. Naturally as a company grows, it must learn to provide a consistently good service and stellar client experience. Having the same team that do the measuring, but also the fitting, was not the most productive way of achieving this. I very soon realised when we were busy measuring, fitting would not be a natural priority as any company will side with getting new orders if there is one. This means the very same person that should be fitting your shutters is distracted by measuring new windows for other clients. We also found that, with many jobs, it is essential to have more than one person to fit. Either due to the simple fact that you often need 2 people to hold the shutters in place for an easy fit, but also for large jobs when our clients want us the get the shutters up as efficiently and quickly as possible. If you have a team of more than 12 fitters, then of course we are able to fit very large jobs in a very short time span. The other slightly sinister problem with the same measure and fitter is that if there is a miss measure, there is a high risk to save face that, they might try to force something to fit which really should be remade. Plantation Shutters have operated as separate fitting and measuring teams for many years and have grown constantly as a result. This is thanks to our many delighted clients and superior service and product. 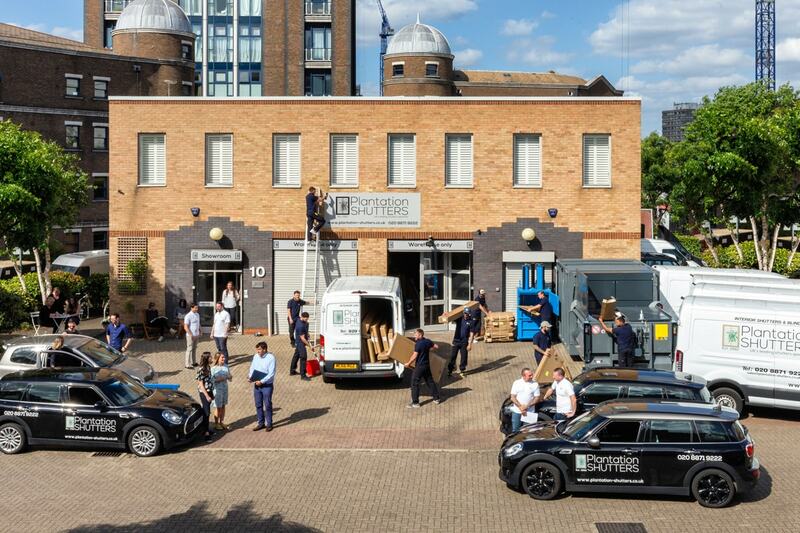 Having separate and entirely dedicated fitting and measuring teams makes for a highly efficient and professional company, further reason why I am proud to say we are London’s leading shutter specialists.
" Plantation Shutters did a fantastic job of designing and installing the shutters at my property in Epsom. The full height bedroom bay was particularly tricky but Dan the surveyor came up with a brilliant solution. The end product is fantastic! The optional blackout blinds are a great feature too. " Plantation shutters are the perfect choice for every room in your home as they are durable, easy to maintain, offer privacy, light control and of course are very stylish! For all your plantation shutter queries please call us now on 020 8871 9222 or email our friendly team today.